Better than the previous version in every way that matters. Budget options don't have to be terrible, and the Clip 2 is a great example of that. Though the small size means that it has a somewhat average sound quality, it's still more than good enough for taking it with you on your next adventure. JBL upgraded a few of their products this year, and we’ve taken a look at almost all of them. We saw the Flip 3, Charge 3, and now we’re taking a look at their little brother. The JBL Clip 2. This is the updated version of the Clip+ which was on a ton of best speakers under $50 lists, including ours. The Clip 2 has a new design, new build materials, and is also $10 more expensive. So is it worth it? In short: Yes. Usually when unboxing a speaker we pull everything out so you can get a good look at each accessory. But we don’t really need to with the JBL Clip 2. Sure, it does come with some warranty information and an instruction booklet, but the accessories that matter (the carabiner clip and 3.5mm audio cable) are built right into the speaker. Though the shape and size is vaguely similar to the previous Clip, the similarities stop there. The all-plastic housing and grill has been replaced entirely with new materials. Now the grill has the same fabric covering found on the Flip 3, which ups its splashproof design to IPX7 waterproof. Now you can submerge it in water if you want to, though I’m not sure why you would. At least you know that it’ll survive if you drop it in a pool. The housing is also now a smooth rubberized plastic, with five small indents for each of the buttons. On the left side you’ll find volume up and down buttons, as well as a call button. The right side has the power button and Bluetooth pairing button which you’ll really only need to use while pairing initially. Hidden under a small flap is the micro USB port for charging, and lining the edges of the speaker is the built-in 3.5mm cable. But the most improved part of the build has to be the new carabiner clip. It’s not longer a small piece of plastic with a hinge on it. Now it’s a legit carabiner that you can clip to your bag which in my opinion makes it perfect for hiking. It’s actually made of metal this time around and feels as solid as it looks. Though it does have a 3.5mm audio cable built-in, we never even needed to use it during testing. The connection isn’t insanely strong but if it’s clipped to your bag or somewhere nearby you shouldn’t have an issue. With nothing in the way reaching 30 feet wasn’t a problem, but with two walls we were only able to get to about 20 feet before skipping occurred. On the brightside it connects instantly every time I turn it on. After pairing it the first time, I never had to bother with Bluetooth settings again which is a big plus in my book. Playback controls work great and I had no issue finding the buttons thanks to the small indents. Way more effective than just having the icons printed on the border. Pressing the button with the small phone icon also doubles as a play/pause button during playback and if you double-tap it you can even skip to the next track. There’s still no returning to a previous track, but it’s more functionality than even something like the Beoplay A1 has and that’s many times more pricey. Battery life is probably the single most important upgrade in my opinion. With most speakers this size a 5 or 6 hour battery life is considered fairly average, but JBL claims the new Clip 2 will get you a solid 8 hours of constant playback. It’s not going to blow your mind, but that’s a big deal considering the previous version topped out at only 5 hours. That extra bump in battery makes this speaker way easier to recommend now, since it’s actually usable for a good portion of the day. Still, don’t expect to get much more than 4 or 5 hours if you’re playing it on max volume. An issue I’ve been realizing is becoming annoyingly persistent. Expectations when it comes to a speaker this small definitely have to be curved somewhat, but the JBL Clip 2 still impresses. We did most of our testing wirelessly, only using the audio cable to make sure it works. Lows are present in the Clip 2, but it’s more like a low/mid that’s posing as the bass. For the most part it works just fine, but sometimes it’s just too much for the little speaker and there’s a good amount of rattling that goes on as the bass clips. The bass in “Sophie Roux” by Lady Danville is a good example of this where it’s fine throughout the chorus, but rattles terribly during transitions mid-way through the verse. The JBL Clip 2 gets a huge push in mids, giving vocals a clear prominence over other elements in the song. 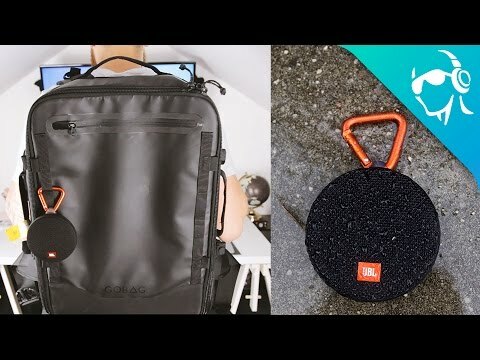 This makes it great if you’re on a hike and want to listen to sing along to your favorite songs, but not for hearing all of the details in your favorite songs. Highs are cut back dramatically, which is probably because there’s only a single full-range driver in the Clip 2. In some songs, like “Ashley” by Lido, the hi-hats and cymbals were so faint that they were eclipsed by bass kicks at some points. The built-in aux cord of the JBL Clip 2 is cleverly hidden at the bottom of the speaker. 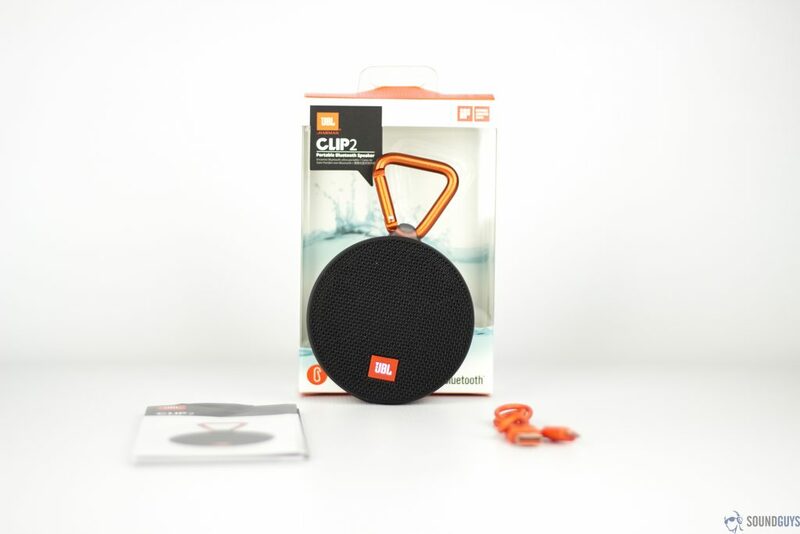 On its side, the JBL Clip 2 has volume and playback controls, so you don’t have to reach for your phone. IPX7-certified, the Clip 2 can not only withstand a few splashes but can also be completely submerged for up to 30 minutes. Overall, the JBL Clip 3 is a good example of the whole being greater than the parts. Though it’s not a great sounding speaker in any one frequency range, all together it somehow works. It gets loud enough that you can bring it with you on a hike or somewhere outdoors, but it’s not just shouting sound at you. It actually sounds good enough that you can enjoy the music, just don’t expect anything more than that. The Clip 2 is an improvement over the Clip+ in every way that matters. There really isn’t a reason not to pick one up if you’re looking for an inexpensive ultra portable speaker. Even if you’re debating getting the Clip+, just spend the extra cash and get this one instead. It’s worth it.